I finished knitting the scarf! Expanda Miranda had to model because the photos I took of myself wearing this frilly scarf (and a University of Idaho shirt) were blurry. 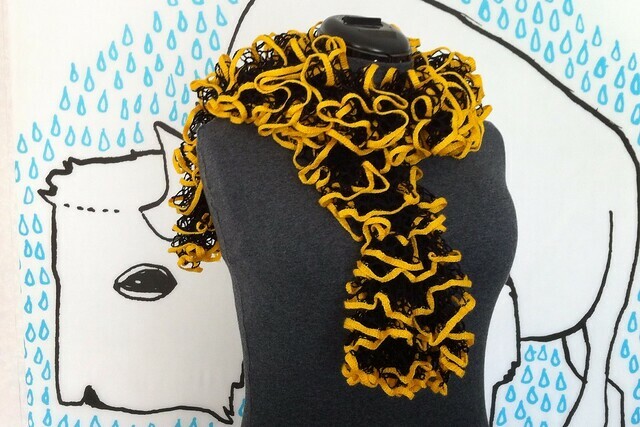 When I was visiting my sister last she pointed out a woman wearing a scarf similar to this and said she wanted one like it so we went to the craft shop and picked up some of this ruffle yarn in Vandal colors so I could make it for her! When I was wearing it for the photoshoot I thought it looked like a clown's falling ruff and for half a second I thought I wanted to knit myself one too. Fortunately I really don't want to deal with that yarn again so I won't have a silly clown scarf that I probably wouldn't wear. YAY!!! I can't wait to wear it! !